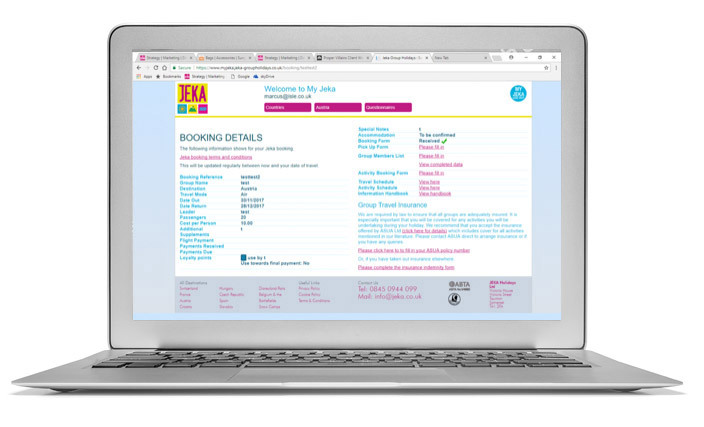 To build a very user friendly web portal for a not very computer literate target audience to enable tour operator Jeka Holidays to move all their booking activity online. MyJeka was launched for the 2016 season, to run through the Isle built and managed Jeka websites, and has been a resounding success. Jeka provide adventure holidays for large groups of young people, and all aspects of a booking journey is covered by MyJeka. Strongly branded throughout, both Jeka and client can see at a glance via an individual dashboard the current status of their booking. The secure system covers insurance, A to Z scheduling, payments, activity bookings (highly complex), individual members details and requirements, a loyalty scheme, and much more. Phase 2 launched January 2018, enhancing the functionality even further.